On the trail few movement patterns help as much as a good hip hinge. Basically your ability to bend at the hips and not the lower back or ankles, it represents your ability to stay balanced and move with power on the bike. While I have talked a lot about the Kettlebell Swing and its role in improving how you are able to apply this movement pattern to the bike, I’ve recently started using another exercise that I like just as much. The DB Cheat Curl actually has some advantages for us as riders over the Kettlebell Swing and I think that you should use both to best develop your hip hinge for the unique demands of mountain biking. For starters, you use a narrower stance that is closer to our stance on the bike. Swings are awesome but the wide stance you have to take does limit its direct carryover somewhat. Plus, you can do Split Stance and Half Kneeling variations, which really builds the specific core strength we need on the bike. However, there is much more to the DB Cheat Curl than simply grabbing some weights and swinging them around. You need to know how to use your hips and not your arms to generate the force, as well as how to use your lats to stabilize your shoulders. In this new video I show you how to do the basic DB Cheat Curl and how to avoid some common mistakes that will rob you of results on the trail. I’ll also show you my favorite variations to help you get even more specific results from this exercise. If you’ve never tried this exercise before then you’ll want to keep in mind that it works best in the 3-6 rep range so you can focus on max power on each rep. Speed of movement and you form is more important than how much weight you do. Try doing 2-3 sets of 6 reps using the Kneeling DB Cheat Curl for the next 4 weeks to get a good feel for this exercise. You’ll have a much better idea of how to snap your hips while keeping your shoulders strong, which will pay off on the trail. If you have any questions about this exercise and how it can help you on the trail please post a comment below, I’d love to hear them. And if you liked this post please click one of the Share or Like buttons below to help spread the word. Using the DB Push Press to improve your Standing Pedaling Power. 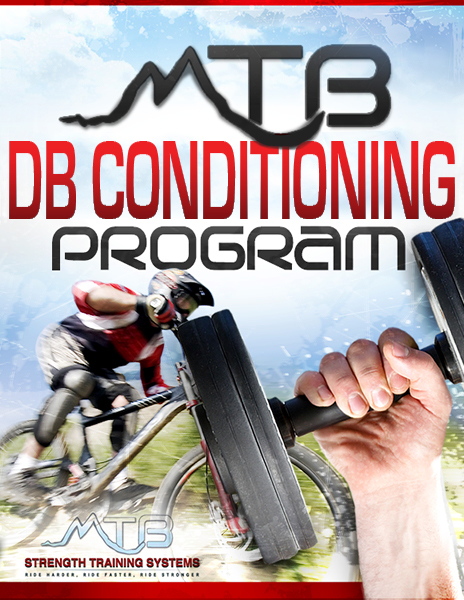 Your chance to win a FREE copy of the new DB Combos Program v5! All you need is 45 minutes and a pair of adjustable dumbbells to see ride changing results with this workout program. This is my most popular workout program for good reason – it is simple but brutally effective. When you’re ready to experience the ride changing power of strength training but you don’t have a lot of time and/ or strength training experience then this is your workout. Coach…While I have a few kettlebells and do the kettlebell swing (still working on my kettlebell swing form) this dumbell movement seems to be a better fit for me. It may be my many years of dumbell use and cheat curls was a regular movement for me; of course I will have to eliminate the over extension at the end of the movement. Thanks once again for a movement I can add to my program. Appreciated. Another great pike specific tip. I’ve no idea how you keep coming up with such great tips. Could this cheat curl be done with one or two kettlebells? Maybe even ending handle down at the top? If not, are 20 lb dumbells like yours a good average weight? If all you have are KBs I’d recommend sticking with a KB Clean. You can do a narrow stance swing and even a clean like you described but I was always a bit worried about hitting my knees and so I use the DBs for narrow stance stuff like this. 20 lbs is a good weight for doing combo drills but you might want something a bit heavier like 30-35 lb DBs if you’re just looking to get a pair to start with.